Sometimes, burning calories and dropping weight is about more than just eating right and hitting the gym regularly — although, by all means, it helps a lot if you eat right and workout. But don’t forget all that time in the margins spent at your desk, at home and on the go, because within all those extra minutes and hours are opportunities to be active. So the next time you’re faced with an elevator, take the stairs. Usually drive to work? Try biking. Got a few minutes to spare each morning before you shower? Jumping jacks can’t hurt. Do those things every day, and by the end of the year, you’ll have made some serious strides in the right direction. Because, as you’ll see below, the little things really add up. Keep in mind calories burned are directly related to your weight, so these estimates will vary person to person. But every 3,500 calories burned roughly equals one pound of fat, so if you keep up these activities, they can have a significant impact over the course of a year. Choosing the stairs over the elevator is always a good idea. It gives your legs a little work, gets your heart moving and, hey — stairs never break down. 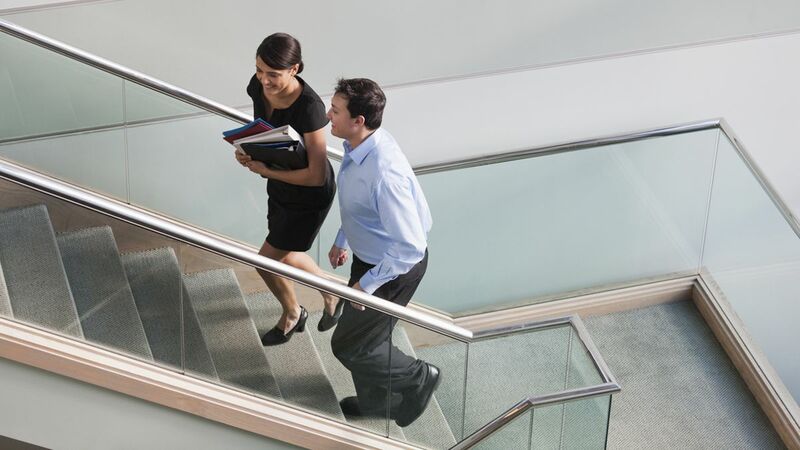 In this case, let’s assume your office is on the fourth floor and you take those stairs twice each day — once when you arrive and again for lunch — for eight flights per day or 40 per week. A good midday break can go a long way toward making it through your afternoon. So eat something healthy for fuel and then venture outside for 15 minutes of fresh air and light exercise. Walking is a great way to clear your head and prepare yourself to tackle the rest of your to-do list. Speaking of walking, experts suggest aiming for 10,000 steps each day. It’s a great goal, and one that’s within reach with a little planning and regular exercise. But try for an extra 1,000 steps every day, regardless of what you’re hitting now, and you’ll reap the rewards. People say sitting is the new smoking. People say a lot of things, but the benefits of consistent activity are clear — it pays to get on your feet and moving. That’s where standing desks come in. If you’re game to give one a try, it’ll do more than just burn calories, as standing up has also been shown to support blood sugar control and posture, too. If you’re going to shower in the morning, you might as well work up a sweat first. Even if you don’t have time to go to the gym or embark on a 5-mile run, you can still get in a solid workout. Fifteen minutes of bodyweight exercises like jumping jacks, pushups, planks and lunges get your heart racing and help you really earn that shower. Not everyone has the benefit of safe cycling routes from their home to their office, but with more cities becoming bike friendly, it’s becoming a more viable option. Plus, it’s a pretty fun way to get around. Let’s say your commute is 5 miles each way. The calorie burn for leisurely cycling at just 10 miles per hour (no one wants to show up to work a sweaty mess) is compelling. A big thanks to KevinGray@myfitnesspal for this great content!